We had two things foremost on our agenda for Monday. Number one was just relaxing and coming down from the Holiday Hub Bub. Actually in retrospect, when our holiday weekend happened, it was low-keyed, peaceful, not really hectic (although I thought it would be) and very enjoyable. Two fun days filled with people we love. 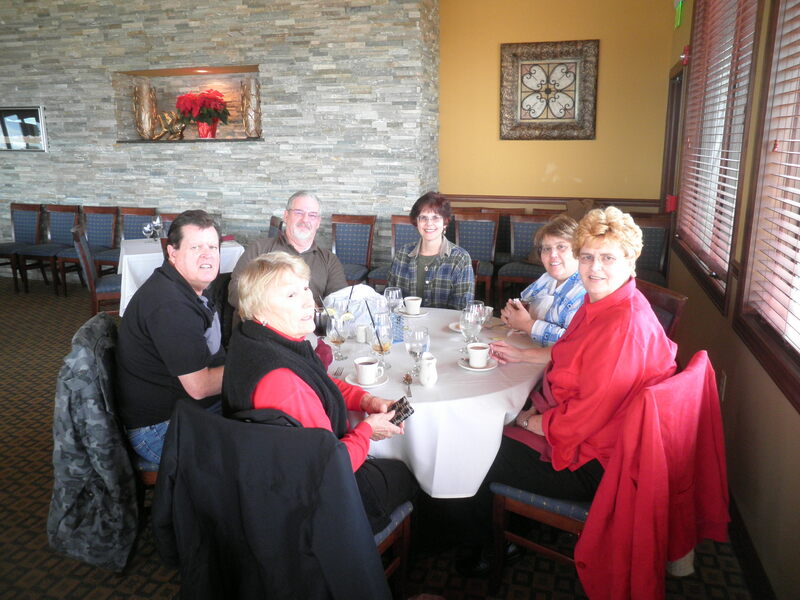 Number two on our agenda was a special lunch to celebrated Gail’s retirement. 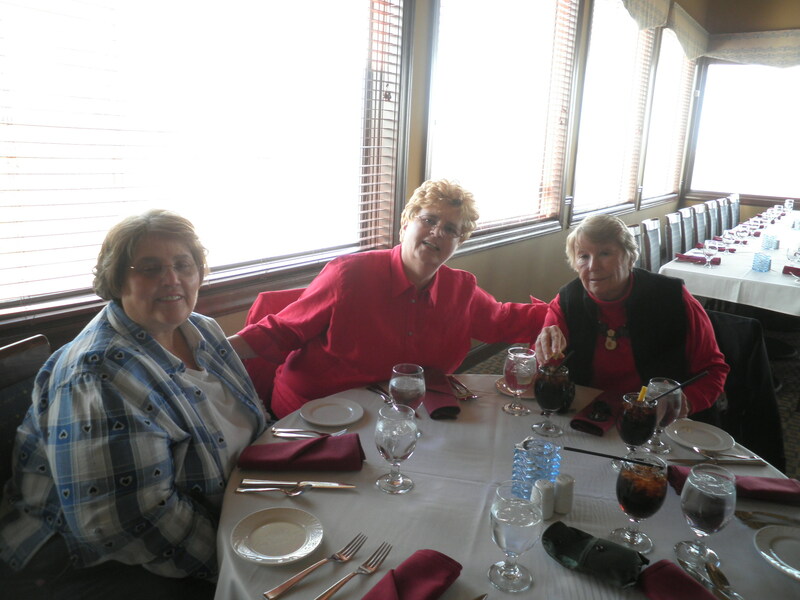 It was decided (by Alice because she didn’t want to hear us all saying..”Where shall we go?”) that we would go to the Riverwinds Restaurant. The restaurant is beautiful and much more elegant than we’re used to. Check their website and you’ll know what I mean. 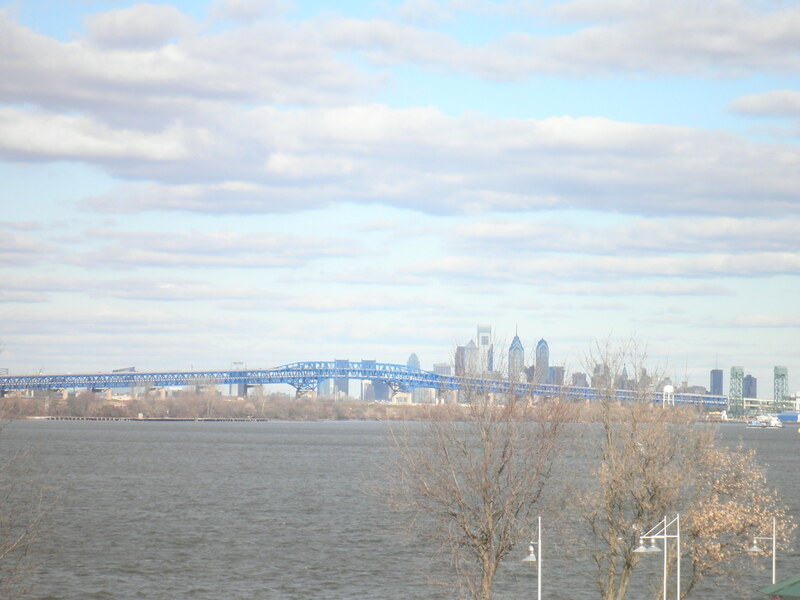 The restaurant is located along the Delaware River giving us a beautiful view of Philadelphia. That’s why we like this room so much. Alice, Gail-the guest of honor and Margot. 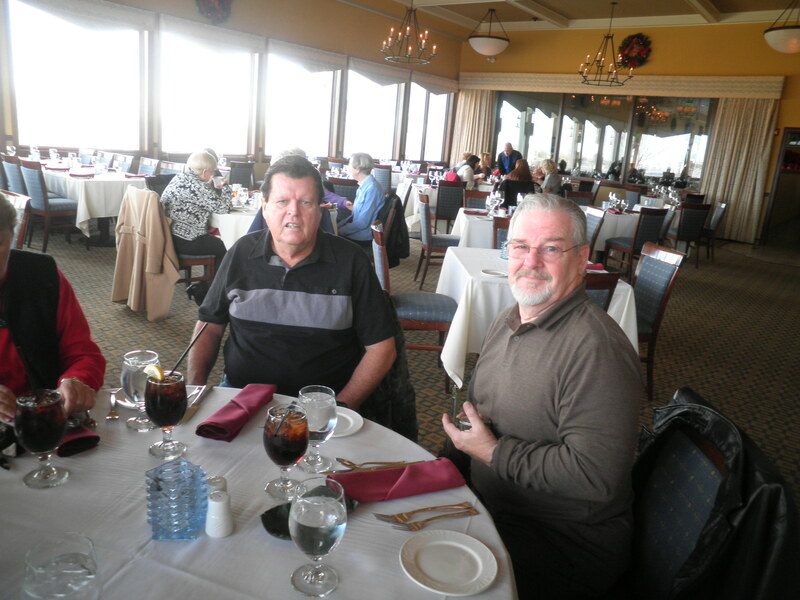 Gail’s brother, Ray and Ralph. Ralph is wearing his “oh, you’re taking my picture again” look on his face. I just Love that! Ralph was trying to teach Ray how to use a compass he got for Christmas. The tutorial continued later on back at Gail’s house. 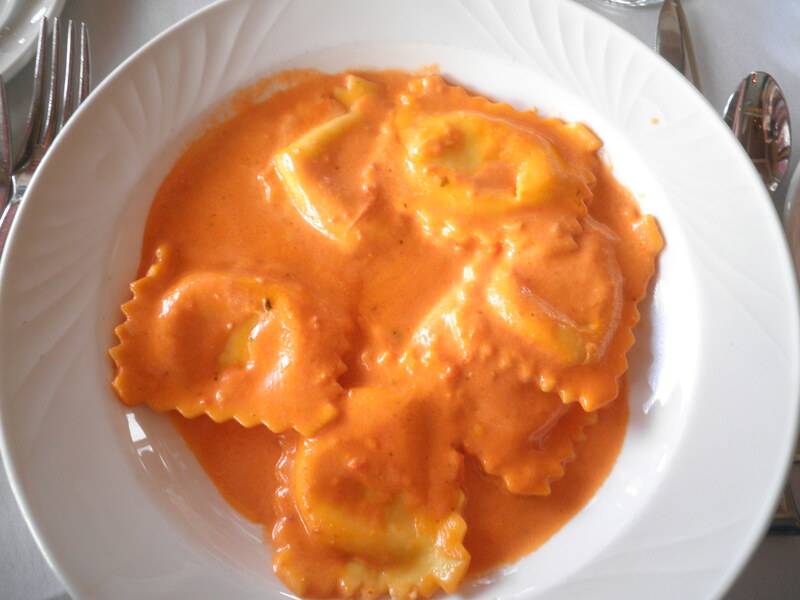 My lunch…4 cheese ravioli with a blush sauce. It was from their lunch specials menu and it was delicious. I had one roll with it so I thought I was doing very well with staying on track. The whole group, photo taken by a passing waiter who offered. The brightness of the room made photos a little washed out. It’s either too much light or not enough. Hard to win with this photography thing! It was a lovely lunch and after that we went back to Gail’s where we enjoyed some time sitting around chatting about our upcoming trip to Florida while Ralph and Ray talked compasses in the kitchen. I believe there might have been a piece of cake eaten during that time. 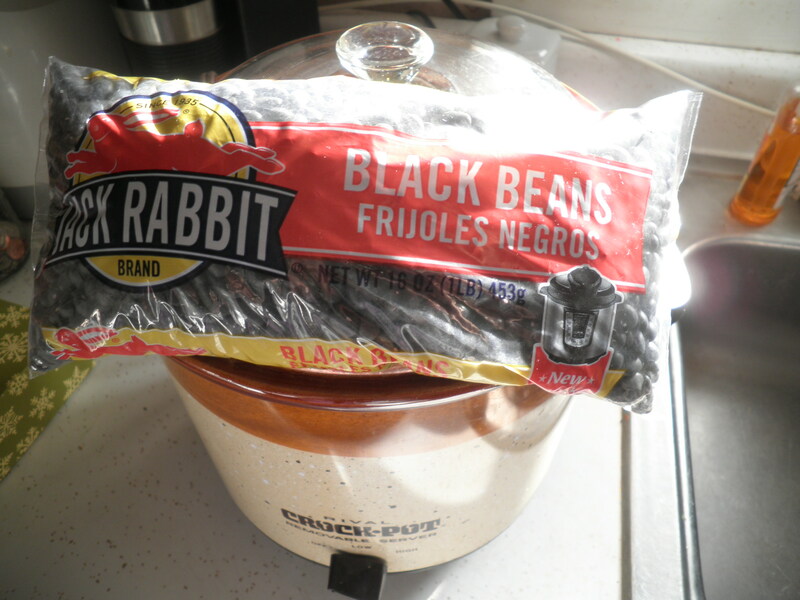 Black beans which I soaked last night are now crocking away in the crock pot. I find it so much easier to stay on track when I have them ready and waiting to become dinner! Ralph had his leftover lunch waiting for his dinner so I decided something easy was in order. 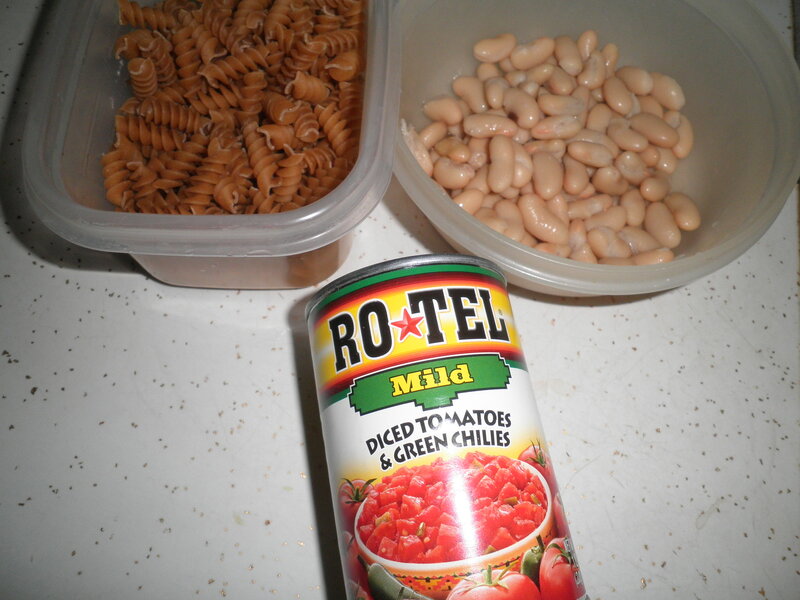 Whole wheat pasta, canned cannelini beans and Ro Tell diced tomatoes with green chilies. What could be simpler. 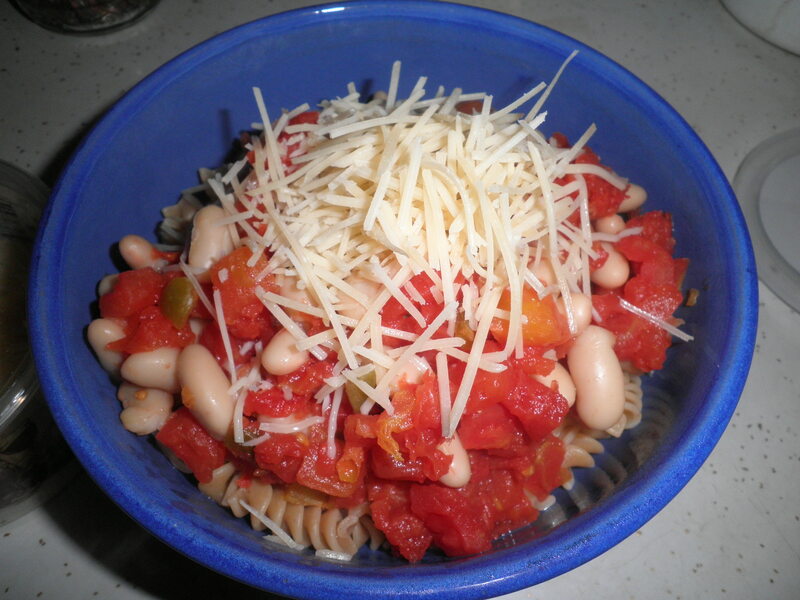 While the pasta cooked, I combined the tomatoes with the beans and warmed them in the microwave in the container the beans had been stored in. Didn’t want to dirty another pot. Worked well. The holidays are tricky when it comes to food, there’s no denying that. At least I’m being mindful of what I’m eating, even if it may be more than I should be eating. I am back on track. No more extra goodies until after weigh in on Saturday. Then New Year’s eve and New Year’s day and I’ll be all set to be a model Weight Watchers member. I need to do that for myself. Weight Watchers has given Lifetime Members a wonderful new tool to make that happen. I’ll tell you about that this week. This entry was posted in Uncategorized and tagged Holiday Hub Bub, pasta, photography, Weight Watchers. Bookmark the permalink. No, Marie…that’s Riverview in Pennsville. I used to work for the people who own that when I was a travel agent. This is in West Deptford, part of the Riverwinds community. I love Riverview too. When I worked for them they would take us there for our Christmas party. Very nice. Happy New Year to you too dear! This is the toughest time (eating wise) for me. I give myself a free pass on the 24th, 25th and 26th, to eat whatever my pretty little heart desires. But then, I’m so off my healthy habits and I feel sluggish and I have demon sugar cravings and my house is still stuffed with the not-so-good stuff. So it’s definitely hard to get back on the wagon! Very cool, Val. I appreciate that info…yes, bless the internet…sometimes! Enjoy your day off! Our house is definitely full of temptations (cheesecake, cookies) that I’m giving into regularly. I’m still hitting the gym and getting in fruit and salads. I figure most of the year isn’t like this…so might as well enjoy! I agree, Zo! We should enjoy it now and do our best to stay on track the rest of the time! Both the view and the ravioli at that restaurant sound spectacular. 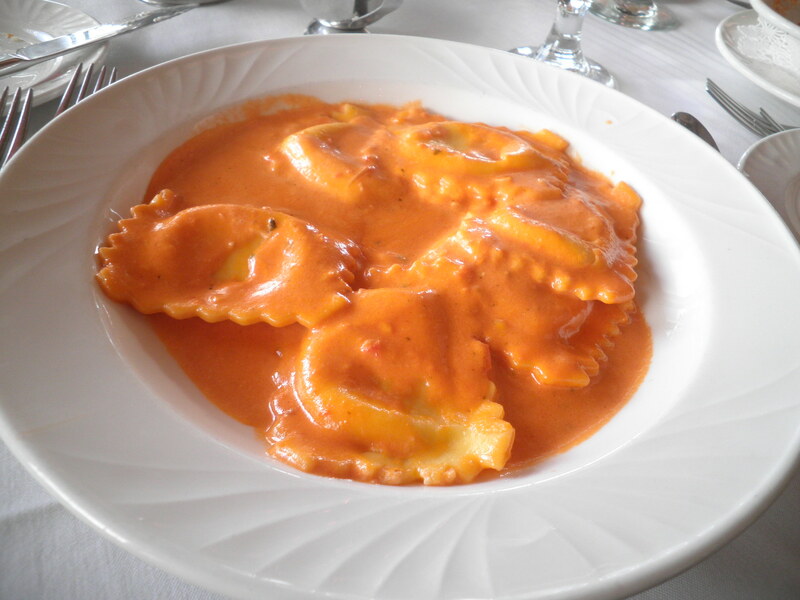 Hmm, now I have a ravioli craving. And I love your quick and easy meal idea! Thanks, Allie! I love quick things that just go together with very little effort! i’ve been playing with photo colors and brightness and all sorts of effects all night… i have to go to sleep now, though, because i stayed up way too late last night with it (my new christmas present). i have had a more unhealthy week than i even expected! and i was not expecting great things. so, at 9:00 tonight, i went to the grocery store and bought several heads of romaine lettuce and soy chicken patties. i’m determined to do something good for me this week! healthy lunches seemed like the best idea. 🙂 you can do it! My plan was to be SO good yesterday. I was during the day, but then the cheesecake got me again last night. Yikes. No More!! Rest of the week is going to be pristine! I get the “you’re taking too many pictures” look too. My kids are so used to it now though that they just ham it up. Cheers to getting back on track, I am with you! Marie, I think kids love to have their pictures taken. My little nephew loves it, just hates sitting still for my pokey camera. He loves it when he makes a “guest appearance” on BCDC!